When conversation and Internet media merge, a lot can happen. From the mundane to the bizarre and back again, the freedom of speech is hyper-active. “Is it just me, or do cats make the world go ‘round?” “This 8 o’clock class will be the death of me! #sotired.” Something as simple as a “So today I…” can turn into a life story. Cat videos, new cars, textbook woes; it is all in there. All right, I am guilty too. I have told my Facebook “friends” about what new book I am reading or informed them of the woes of finals (which most of them are already familiar with). However, would I ordinarily broadcast those kinds of things to hundreds of people…in real life? A million times no. In the online scheme of things, we Internet denizens can be haphazard and injudicious sometimes. The realm of “social” media, as one to a mass audience, can have an impersonal feel to it at times (at least for me). So it is easy to hide behind a screen, type anything we want and not even give it a second thought. Taken out of a real-life situation, we post things that we might not say in real life. We lose sight of the power that our words can have. This seems to happen most often in Facebook debates. One controversial picture, one hot-button status and suddenly the post goes up in comments – sometimes 83 of them and counting – as the original poster and so-called “friend” carry on. 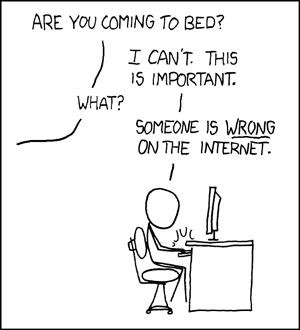 Although I know some people who debate just as much in real life as they do online, other people who are not known for debating might suddenly become an ardent opponent (or activist) on the web. I am not saying that people should not post these kinds of issues or topics, but it might be a good idea not to. On the other hand, there will always be people who disagree with us. Counter-arguments will naturally follow. Social media is in fact a great way to spread information about something and discuss topics, but maybe it is not the best way. If you do upload a controversial post, keep in mind that people will disagree with you. Try not to take counter-arguments personally and personally attack the opponent in turn. On the same note, if you are on the opposing side and decide to add to the discussion, do so respectfully. Another option is just to not post the picture in the first place, or not to get involved. If lots of people join the discussion, the original poster should try his or her best to keep it under control, especially if he/she asks a question and allows for open discussion (because they are the one who posted it in the first place). If the comments section does get too long or the posters get carried away, it would be a good idea to move it to the message box or chat. On another note, personal disagreements between people, like “you said such and such to me yesterday and you should be sorry” definitely do not need to be in the public arena. As commenters discuss the issue, they should try to stick to the topic and not veer off in rabbit trails. If they want to argue a semi-related (but not really) issue, again, it should be moved elsewhere. Think about how you would respectfully reply to an opponent, just as if you were talking face-to-face. Also, it always helps to have a basic knowledge of debating before jumping in. Personally, I think it is best just to stay out of it. Those of you who like a little competition now and then can exercise some common sense and courtesy. Nevertheless, social media should be used to build each other up, and that applies to all of us.